Teesside University’s pioneering approach to entrepreneurship has been showcased to senior leaders from across the higher education sector. Professor Stuart Corbridge, Vice-Chancellor of Durham University (front-left) with Professor Paul Croney, Vice-Chancellor of Teesside University (front-right) and speakers and guests of the Entrepreneurial Leaders programme. They were taking part in the Entrepreneurial Leaders programme delivered by the National Centre for Entrepreneurship in Education (NCEE). The four-day module, on the theme of universities and their regions and using Teesside as a case study, was hosted by the University. Participants spent time at the University’s Middlesbrough and Darlington campuses, where they learned about the different ways in which Teesside works with businesses and stakeholders to drive enterprise and promote economic growth in the region. The NCEE works with senior university staff, providing a range of services to ensure UK higher education remains at the forefront of enterprise and entrepreneurship. Its Entrepreneurial Leaders programme is designed to help leaders drive and respond to change in a fast-moving external environment. During their visit to Teesside, representatives from 13 different universities heard from a range of senior figures, including Vice-Chancellor Professor Paul Croney, Pro Vice-Chancellor (Enterprise and Business Engagement) Professor Jane Turner OBE, and Pro Vice-Chancellor (Learning and Teaching) Mark Simpson. There was also a presentation from Associate Deans Siobhan Fenton and Linda Nelson, who are responsible for the University’s enterprise and business engagement agenda in the School of Computing, Design & the Arts and the School of Health & Social Care. There was also a visit to mima, the Middlesbrough Institute of Modern Art which is owned and managed by Teesside University, and a session with the University’s business support team in Launchpad, the University incubator, where delegates also met with start-up companies. Other key speakers included Professor Stuart Corbridge, Vice-Chancellor of Durham University, David Charles, Professor of Enterprise and Innovation at Northumbria University, and senior representatives from Teesside University’s partners in the public and private sectors, including the Tees Valley Combined Authority, Darlington Borough Council, North East England Chamber of Commerce and the Centre for Process Innovation. Laura Woods, Director of The Forge, Teesside University’s business hub, said: 'We were delighted to welcome the Entrepreneurial Leaders programme to the University. 'We take our role as an anchor institution very seriously, and we put strong emphasis on helping to achieve real economic growth by promoting enterprise and developing quality graduate talent. 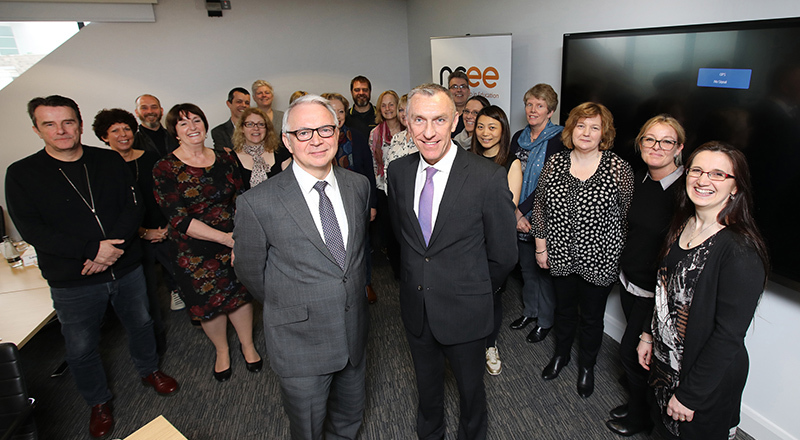 Teesside University's pioneering approach to entrepreneurship has been showcased to senior leaders from across the higher education sector.